Does anyone use the Super Drive? No. Can you install more than 16GB of ram? Yes. Apple has added a new feature which has existed for ages, SSD caching and released their own iteration, hardly groundbreaking. Unless you carry your iMac around with you like a laptop, then a desktop computer isn't weight limited. Eight pounds lighter means nothing when the computer will spend the majority of its life on a desk. Your example uses the top spec iMac so it is specious as the majority will not be spending the thousands of the spec you have stated. The stock models are nothing more than a minor improvements. Ivy Bridge = Sandy Bridge + 10% IPC plus a mid-range GPU are hardly earth shattering. Oh stop your complaining. It improves the footprint, the materials used, the total volume, the heat dissipation, the weight. After release of iMac2012, I was so glad that I bought 2011 model. I thought it will be better, but I really disapointed with new one. It weight is reduced - for what? This isn't laptop, I don't care of my iMac weight, it stands on my table all time. No improvement here. It's thinner (ofc no one believes it's only 5mm, because if you look from behind, you'll understand what I mean) - for what? It stands on the table and it occupies the same space because of the stand. No improvement here. DVD drive removed - nothing to say, it's really not major feature, but after removing DVD they could add normal desktop videocard, not making desktop computer thinner. So I doesn't really care about DVD. It cost more than 2011 iMac (1199 vs 1299 for low-end one). You pay more, for the same computer. Not good. 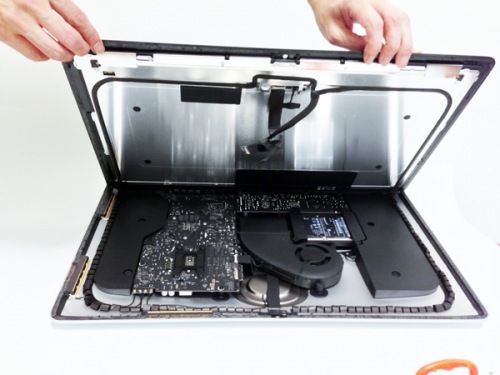 It's HDD has 5400rpm, while previous version of iMac has 7400rpm. So we got slower HDD, very bad. Fusion drive is they only improvement I see in this iMac, but I can add SSD instead of Optical Drive in my imac2011, and with 10 terminal command make Fusion Drive myself. So after all 2012 iMac has 1 good thing(Fusion drive), 3 useless innovations (thin, weight, DVD) and 3 things that makes it worse than previous generation(no RAM upgrade, slower HDD, higher price). Bravo Apple first computer I don't want to buy. P.S. Sorry for my English, it's not my native. no no no no no. why are people so misinformed?